Club Penguin Cheats by Mimo777 Club Penguin Cheats by Mimo777: Is Club Penguin Just Too Much Anymore?! It is too much! When I beta tested (on my old account), I didn't realize it would get this sophisticated! That's it today folks for Keylime244 ranting! It's too public! I like the way it works and how big it is but I think there are too many people! Yes yes I do I miss them so. I still love Club Penguin but I do miss it when they called it CHRISTMAS Party. And now i'm hungry. I do miss them they were nicer back in those days. it would be great if everything wasn't MEMBERS ONLY!!! Mimo your right Club penguin used to be a peaceful simple island but its too crowded now and its too much,I want old CP back! It was more fun back then. Waddle on CP and Mimo! Merry Christmas! And a happy new year! Yeah, it's is getting too much. For me it doesn't even load properly and I'm on a 3MB connection! Mimo, how can you even post that. I know how much it has changed, and I think it has changed for the better. I love CP, and I always will. Yes, old clubpenguin was fun but since CP went all commercial It isn't as fun. Every year at the birthday party they should have a room change like the VR room to remember what the old CP was like year after year changing alittle. When Disney bought club penguin in 2007 everything started to be for members only now if you're a non-member you cant play jet pack adventure, thin ice or astro barrier w/o a membership. I can barley play it on my old 1996 compaq w/o it lagging. Too Disney it's all about the money. Well, Mimo, ya got one thing wrong, in New Zealand it's Christmas DAY! It's WAY too much. The newspaper was the LAST thing I had of old Club Penguin! Seriously, Disney is just trying WAY to hard! Like everyone els eis saying, too much. They should still have Big Wigs Catalog and it's too much for new kids playing they think its paridise and we the old penguins want the old cp back. my penguin is 1272 days old and I also have a older penguin that is about 1680 days old. I think it is way too much. Well I remember that my favorite game was Jet Pack Adventure. But then all these stamps came a long and only Level 1 was for non-members. I'm a member, but all my friends are non- members, and I feel bad for them. urgh, too much, over decorating, the chat filters, missing out on easter and st patricks, disney are close to officially ruining cp! Well, Im 981 days old at Club Penguin, I started at April 2008 after the April Fools Party. It was so simpler those days, quiet (well not) and more non-member opportunity. Now, Members has more opportunity than non-members. Also, its so full on Club Penguin. People just get bored on Club Penguin because its too much, too busy and too full. PS: Happy Christmas and Happy New Year, Mimo! I hope you achieve lots and lots next year! It has to be like that, because some people dosent celebrate Christmas. Long time since I modded. Same dude. I emailed CP, and they said Club Penguin is getting full by a minute and I have to go to Low Screen with Low Resolution. Hey Mimo! Have a merry Christmas! My penguin is about 3 years old. I definetley miss the old times of Club Penguin. Can't we go back to the simpler time, where we could hang out, relax, maybe do a mission? Club Penguin has become too much. Well i Pretty Much Miss the Old Club Penguin ALOT.i Mean club Penguin Was Fine just The way They Were..
Too Much! Disney has gone far and made to worser! My penguin is 1323 days old and I miss the good old days of Club Penguin, which was before Disney bought club penguin. In the good old days you could just waddle around a simple little island with a few fun events now and then. Club Penguin has done alot for us, don't you recon they'd be annoyed if we all turned round and said, "We don't like the year of hard work you've put in to make club penguin a better place. Can you demolish it all and make it what it used to be?". I mean, we wished alot of things on, like the fire and water dojo. That's cool, is it not? i know it's busy, but after all, that's because disney had taken over and has done alot of cool things. I miss the PSA, when EPF agents were considered high up, and when I could go into the cuboard and see all the things other's couldn't. Although Disney have wrecked a couple of things, they've improved alot more, have they not? So actually, i think the question should be, what's been the best in this club penguin year so far, not if it's bad and what's bad about it. (No offense) However,I think they should bring back the big missions and get rid of Field opps. Its so much! I mean EVERYBODY just sits around now because theres so much but its boring stuff! You guys got to remember that club penguin staff is still a part of club penguin. Some of you guys are just blaming it on disney. Club Penguin staff most likely has to agree with what they are doing!!!! Sure I agree with all of you (pretty much) and I COMPLETELY MISS THE OLD CLUB PENGUIN. but dont blame disney for everything. things most likely would have changed even if disney didn't come along. It has got a bit over the top but it is still fun to play. CP was so much easier back then. There weren't any annoying preps in the ice rink. Old CP was more original. Now Disney just put Disney cameos in that game. So much noobs now. Disney is bringing back rare items now. Old CP took the time to think of new items. And what happened to the awesome old CP igloo music? The amazing hard rock, driving guitar, beach mix, and jazz music, all gone! The parties in old CP were more mature. Now Disney makes kind of crazy parties. And why did the look of the stadium and the ice rink have to change? I liked their old look better. Crazy chat filters-nothing will show!Hannah Montana outfit? Gotta be kidding me. The old HQ was fine! Why did Disney have to destroy it? And the dojo? Used for amazing wars and parties and stuff. And now, it's like "You have to be a member to have fun in the party or else you will get banned for no reason." Lol. And ever since CP's so worldly, we don't have like the fiesta, summer parties, St. Patrick's parties, and the Easter egg hunt anymore! If CP ends its contract with Disney, then it will be better when it goes back with Rsnail games! Someone said that stamps were the only thing great. Ever since stamps came out, Thin Ice, Astro Barrier, Jet Pack, Aqua Grabber are member only for most of the game. I miss the simple days of the Dojo when it was mysterious and ninjas were a topic of debate. Now anyone and everyone can be a ninja and there's no mystery. Merry X-Mas Mimo!!! Im IN Au And its 6 in the mornin + im wearing a shirt saying "the fat man is coming! lol"
i remember the good old days,my first halloween in 2007( i loved it too much,and i still remember that epic party and how nice was the town decorated).Ia lso remember the Carol Christmas,but now,everything is too much,even the coins for change system.I think all of us miss the good old times and the good old party.I'm 14 now and i would love to see again all the good partys,but,unfortunately,the technology just turned some extraordinary tings into something really bad!But,we can't resist progress,which unfortunately leads this beutyfull game to regression.Mimo,when i started CP,i loved all the things you shared with us,about all parties,but now...i'm sick of playing all of the new stupid features.A Merry Christmas to everyone.Mimo,i'll keep watching your blog,hoping for something good ;). Too many bugs. I miss the days when I could just walk around and say hi to people and play games. Trust me, I was a penguin for over 600 days. it had better catalogs, better filters (i hate the current filters. they block out almost everyword. if a word you typed gets filtered, the whole message will dissapear, and other penguins will think your ignoring them), and they didn't bring back the items. penguins want to be rare (which means have old items), but they can't anymore! i have a rare item but if they bring it back, i will get so mad! and back then, nonmembers could play all the levels and now THEY CAN'T!!!! and all the fun events were nonmembers. now everything IS MEMBERS ONLY! Hi mimo im in england and im looking forward to christmas but I think clubpenguin is to much. I remeber in 2006 where everything was nice and peaceful but this holiday party I think is to little! I like the old days better. Better parties, better outfits, better furinure. I really miss the old times! Its so busy now i hardly go on it now! I like Club Penguin but I don't play it much anymore. It is a bit too much. I don't really play it but I still like to read your blogs. I miss the old days, when Disney hadn't bought club penguin. I liked it when Club penguin still had a few traces from Paintboy100. They even changed the music on Bean Counters! I remember in 2007 it was all simple and the parties (Western Party/ Water Party) were better then. Now they didn't have the Water Party and the Field-Ops make me sick. Old Club Penguin had better music with Jazz, Surfs Up (or whatever), and Water Party. CP is just too much and before I played on it all day now I play on different stuff. I just check your blog to see what's happenin'. That's it..
club penguin is pretty awesome but their going over the top! my penguin is 1683 days old and the old times were way better! less penguins less slowness! i remeber the first time i met rockhopper and hardly anyone was bothering him gust sitting and talking! I COULD ACTUALY SEE HIM! I think that people say that Club Penguin is "just in it for the money." I agree. But, look at the economy. Who WOULDN'T be in it for the money? I think that they are trying their hardest and we should give them a break. What do we know? After all, we're just kids. im 1006 days old i think it was better in the old days there was blue vs red snowball fights in the dojo,being unfair to non members but the good things about it are good games easy ways to earn coins (sarcasim for the next bit) and lots of repetative themes at parties. there sould be an "old times" event for the oldest penguins!!! I think it's too much. 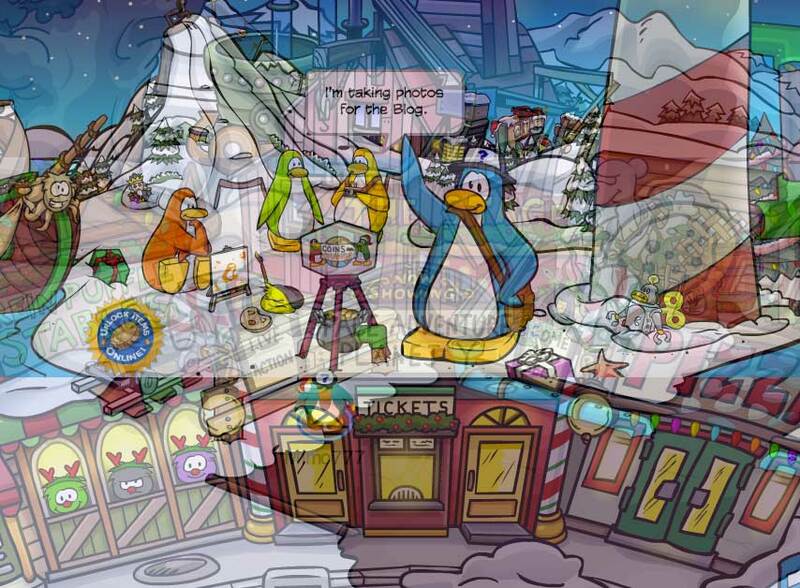 I feel bad for non members, and cp was so fun back then with april fools parties! too much... ever since disney bought CP i havent been a big fan. ive been around since early 06. also i think im just getting too old for it. ya kno what im sayn? only good thing is game stamps cause u get double money. Disney to me has only ruined cp. They keep making it so bad with these weird add ons. You can barely say something without bein banned it's annoying. I am not that old of a penguin but when I was new, it was much easier to have fun on CP. There are some fun stuff now, but there were funner stuff earlier. I've been on CP for 1679 days (we're almost twins, Cry Bayb!) and I really do miss the simple days. It used to be that members were only special because they could buy stuff in the catalogs, but now nonmembers barely get to do anything fun D: paying real money so that you can have fake money to buy fake clothes with is just stupid to me. When i first joined cp 1013 days ago it was really fun but now it seems a little boring, they still have good parties. does anyone remember the Valantines Day party? It has grown to be too complicated!! I think i had more fun before the stage, before all of the weekly missions... its just all too much!! I think ClubPenguin was better off when it first came out, simple!! The ClubPenguin board members think this will improve the website but it just slows it down!! Whos with me?? The parties usually celebrate random things! Now, there's so many parties there's hardly any time to see what Club Penguin looks like behind the decorations! I like Club Penguin! I do not think they are going overboard. I enjoy the field Ops and you can still do old missions. The new missions are more fun because they are harder and longer. The EPF is also very cool to me and you can still see the old HQs. With more players there needs to be more rooms so players stay interested. I think many penguins care for the Water and fire dojos and I like the Regular Dojo. The holiday parties are still the same. I can admit the Christmas party was not the best this year but I think it was not good because club penguin is working on the secret room and they just started a new newspaper. And who knows what else they are doing. The newspaper is okay. I do not mind it, but that is just my opinion. I like the catalogs! There is more variety and they are bringing back old clothing items, which I like because I am only 1,100 days old and I do not have all that cool rare stuff! I remember the separate wigs catalog, but I did not care when they just put both together. Plus, the treasure books have some older items. MIMO you are so RIGHT ! and everything is for members ! like Disney needs more money ! Yeah, I miss the old days of club penguin. When members and non-members were equal in nonexistent rankings (some of you will know what I mean.) When the Dojo was like a secret room that few went to. When you got an item, and it wasn't given out again, and you would keep that as a marking of your age. When all games were free. Even the FISH is gone. I'd think they would move it into the new "HQ". Also, I miss the Arctic server. That, I think, was the best server. Penguins were pretty friendly on that. But now, since the servers are all server, it is a server like any other. Still trying to find a good server like good old Arctic. I like the old CP because you didn't get banned and it actually was more simple but in a fun way! I also like the new CP because it's super fun with new things! I wish there was both of them! The old CP called "Olden CP!" because of the olden days and new CP would be called "Future CP!" the parties arent as fun as they were when they were simple and the free items are only hats and backgrounds now, I miss getting free shirts that werent just for members! I liked the old days. No weird missions, werid stuff, and now even a werid newspaper. club penguin will NEVER be boring for me!i have played for a year and that dosnt sound a lot, but i wont get bored of it! I like the old times better. Everything was simple yet fun. too many ppl and the whole point has changed. now its hacking and famous peeps and rare peeps i liked it when you could just hang out,play games and have fun! Yeah, maybe club penguin back then was club penguin, not club party special event epf new something penguin. I personally liked to relax but they fit good things. cp is busier since its grown to keep the players playing. I think it's way too much. I'm about 1800 days on clubpenguin and everything was just simpler and not a big deal back then. I think they should have a back to the old days of cp party! It could show the newer penguins of the great place cp was before! All disney cares about is money, not our fun. People don't realize that in older days it was more fun, so they are saying that now it is more fun. Even though they don't know what it was like before. I like all of the new things and stuff, but yeah I do prefer the simpler old parties. I also think that it isn't fair that everything is members only (and I'm a member). I've been playing CP for 4 years now and have been a member for the last year and a 1/2 and I think it is too busy and too crowded. i think its too much. it was way better before they added all the new stuff and made it pretty much a members only site. i mean, 12,000 coins just for being a member? seriously? Well,I'm 1035 days old so that means that I've experienced some of the old stuff. Don't you miss when you choose your own country with the servers? I think its to much with the postcards, stamps, ninjas...etc. etc. etc. Ninjas didnt even exist before. also, I think club penguins getting kinda cheap cause most of the stuff involves membership. mimo! Finally u got it!They need to make an older kid version, and a little kid version. I remeber old cp, which used to be a whole lot beta.I made a list of 23 reasons club penguin is not as fun anymore. Like parties, new puffles, catologs, and more! Ah, and remember when ice berg, mine, and dojo wasn't completely revealed on the map? And remember that there was no stage, forest or cove? CP has almost twice the rooms now. Its all to much, I havn't been playing since games were members only! Simple was better! Then, (the olden days) being an agent meant something! people could say what ever they wanted and agents would have a job! Back then, you could do more, there were fun glitches and easy parties. Also... now, it takes forever to load. I wish clubpenguin was like it was between the transition from the guy from Canada to Disney. I agree. although I am a member, most of my friends cannot afford it. This has led us to trying to create our own game... without members. I think that clubpenguin should have a nonmember catolog. with items non-member people can get. Not enough for non-members to take part in. They don't even let your penguin have a suit of clothes. It's too much money to ask people to spend on something that doesn't even really exist. My money is real so I will keep it and have a naked, bored penguin. hey guys, i understand that you and i all want some of the old club penguin back, i mean come on my penguin is 1307 days old now and the good old days were great, but dont you think youre complaining a bit too much? i mean, the only reason most of you dont enjoy "new" club penguin is because you grew out of club penguin altogether. Well, a basic summary of the comments I've seen so far is, yes Club Penguin is a bit complex, and theres too much member-only stuff. I haven't been on Club Penguin very long, so I don't really know what it used to be like, but going way back, Penguin Chat 3 sounded more fun than Club Penguin today! I make it my business to investigate Penguin Chat, and Rocketsnail, (the inventor of Penguin Chat 3) seemed to have the right idea of what people want in a virtual world. I personally think Club Penguin got more and more only in it for the money since they bought it from Rocketsnail. Just my opinion. I could go on way more than this about Penguin chat, experimental penguins, etc., but I will spare all you people out there by stopping this comment. i like being a ninja and all but i miss having the dojo being mysterious. and i have CP game day for the Wii and its really fun but now there has to be other teams instead of Red vs Blue. I hope Club Penguin is reading these comments, because I have read over half of them, and almost all of them say "Club Penguin is WAY too complex" or "There isn't enough nonmember stuff!" so really you should listen Club Penguin, I mean what would Rocketsnail think? Really! One of my problems with Club Penguin is that you make a new friend, but then you almost never see them, again! It's just too many people! Cp is putting a lot thro, I Ppreciate ghat but I really do miss the old times. The areas use to be not so crowded and everything wasn't all ""members only"". It was a casual game and the improvements they re making are good but too much. The HQ was really Fun but the EPF is horrible and boring. Im sorry this has nothing to do with the current topic but, Its Xmas Today and got some clubpenguin codes. I have entered one and it says You've entered five codes over all and have unlocked the Super Exclusive page and two bonus items of your choice! I have a Pic but i dont know how to get it across to you. If you know a way mimo, say something in the comments and I will see it. Its Sooooooooooooooo Awesome. It looks cooler, and the HQ is better, but it is WAAAAAAAAAAAY to sophisticated with the mission/ field ops now. People just sit around and do NOTHING because it's just too much!!! Also, the chat filters are way too extreme, couldn't they just block out the word, not the entire sentence!? People think that the other person is IGNORING them. Sheesh, and there's literlly NOTHING non-members can do! They could only get colors and backgrounds and pins. Sometimes some free items, which CP never does, they just bring back old items. Also, they think this is for the best but while their saying that people are running around going on dates! Agents still have jobs: Field Ops and Keeping Club Penguin safe! We also still have missions! Club Penguin would not be safe without filters so we can still say things, just not bad things! The glitches were fun, but they eventually had to be fixed or club Penguin would have probably been filled with too many bugs and they could have had to shut the website down. I will admit parties are becoming less fun and are repeating, but since club penguin created the new, easy to make newspaper, they said they have more time to improve the parties! Maybe your computer loads things slow because mine goes fast! I know alot of penguins would like to see the old club penguin back. Maybe we can email them and ask about having an "Old Cub Penguin" Party. I miss the CP days back in 2007. Sigh... I wish I could have a Club Penguin Time Machine that allows you to play any day in Club Penguin. But this doesn't mean I hate the new Club Penguin, or that it's getting boring. I love the new stuff they add. But I'm saying old CP was funner. Many people say Disney ruined it all, and part of it is true, but hey! Who made possible Club Penguin plush toys? Video games? Mix 'n Match Figures? Real life CJ cards? CODES??? I have problems/suggestions for CP!!! I am 1141 days old so I know what has changed!!! Mimo! There is a weird glitch! In your iggy if you bought the flooring it only shows the bottem half not the top! club penguin make more rooms!! You have to many penguins and not enough rooms! I'm 1709 Days old, I remember when there were like 4 rooms and no map. The gift shop was a real shop to buy actual merchandise. Compared to that, CP is ten times better. Membership isn't THAT expensive, and the stamps are fun. But everything is much more open so it's not as cool trying to find secret stuff, like they announce secrets in the paper...so they aren't... secret. 1. Dojo, Fire Dojo, Water Dojo and future Snow dojo! 2. Bringing back old stuff! Im not that rare so i like the old stuff! 3. Stamps! Mimo had a great STAMPede Party! Non members can get them too, just not as many! 4. Tours and missions have not changed! Anyone can be an agent or tour guide. 5. Ice Rink AND stadium! 6. Everybody can get backgrounds and pins! Yes, there are alot of member things, but i think anyone can probably afford a $6 membership card. It is actually not boring. Your complaining because your not trying to have fun! I think you're just looking at part of the picture. You have to look at the whole thing and try to enjoy it! I think it is fun, but that's just me. Just no its not big its boring if you think its big in size just no. Look at runescape's map and then you will see big. I seriously mean this its a midget game it has like 7 places no quests and like 11 mini games. So just no no no o lol sorry no. runescape has more players than clubpenguin and so does maplestory and habbo and all them games. clubpenguin is a disgrace to be called a video game. and to the kids that think its 2 much faillllll. Mimo! Finally u got it! They need to make an older kid version, and a little kid version. I remeber old cp, which used to be a whole lot beta.I made a list of 23 reasons club penguin is not as fun anymore. Like parties, new puffles, catologs, and more! Well since the new newspaper is easier to make, Club Penguin has more time to improve parties! I think almost all penguins adore new puffles! What is wrong with the catalogs? Nothing! I like how they bring back old stuff because then new members can buy that too and be “rare.” Maybe older penguins do not like it because they already have it, but they are creating new items! Overall, its a great thing I love to play after school or on the weekends of i have time, but i wish i could go back to the good ol' days. I loved the old days when clubpenguin nonmembers could get more than just hats. Nowadays, nonmembers can't do much. Honestly I think its getting over populated, I mean why do you think they made new servers? And Card Jistue isnt much of a game as just being patient for your belts. I think the christmas party SHOULD be called the goliday party. Some people have different religions too. Although CP should consider other religions holidays. Bringing puffles into games just to get more coins is a rip! Getting coins used to be a challenge! Now its just "Time to play cart surfer to get that 2000 coin igloo (after a game) K I can get it.". Stamps are just like achievements for the 360, You try to get all of them just for braging rights. So what? You wasted 30 minutes of your life, Whoopdee stinkin doo. There are so much new items, new items get rare FAST. Old ones are easily forgotten. And Herbert was right, CP does party too much! I'm sick and tired of this crap! what the heck is up with you people saying that disney ruined club penguin. disney made club penguin BETTER!! and about all this crap about too much stuff being members only disney is doing all that because they want to give people a better reason to become members because no ppl buying membership means no money and no money means no club penguin AT ALL!!!! 1. Club Penguin is trying their best to make the game better! 2.Even though most penguins over 2 years old say that bringing back old items is bad because they want to be RARE or that Club Penguin has too much that is "too boring" all you REAL Club Penguin fans just ENJOY what they have created and hope for more! My penguin is only ONE YEAR OLD and I was thinking about the past and present! So don't blame Club Penguin or Disney because without them we wouldn't of joined! I mean seriously! What got you to join? Was it that you could have a pet puffle? Was it so you could costomize your igloo or penguin? Or was it so that you can make buddies? Was it that you can explore Club Penguin? I love it, but we don't have the freedom to say something with a period. Only exclamation points and question marks. Things don't go through the filter... its weird. Like if you say "one", it will not go through to the other penguins, therefore we are left with saying "won", and giving us bad spelling... we can't say like, we have to say "liek". I say if you don't get banned for it, it should show up. I loved the old parties and catalogs, but I also love the new ones. There is too many glitches now-a-days. Sometimes it just too much... such as almost every party now. You can't acess many rooms if your not a member, you can't even play certain game levels as a non-member! I remember 2 years of begging for a membership... and got it in 2008... but now, its like "MEMBERS GET THIS!" and "MEMBERS GET THAT!" Also, they bring back old items WAY to much. Especially free items, which is not fair to non-member old penguins. Also, there is too many... little things you could say? When I mean little, like, its growing more into 5 year olds can be playing. Well im 12, I certainly don't have a problem, but some of the things that go on cp are... not their age. One major thing, THE NEWS PAPER. They say "Oh it saves paper... and our earth." I hate to break it to you CP, but its virtual! Plus it makes no sense, its long on the front side and short on the back. They cut off comics and games/puzzles. The aunt arctic section is not enough room. I don't like it, I miss the old news paper. I agree. I just don't like when people in the town are like "OLD CP! OLD CP!" Its like be thankful that we even have a CP. Just what I don't like... they add on to old games, or change the games. "Well... hmm, Ballistic Bisquit... how about Hydro Hopper?!" I'm getting tired of Club Penguin. I decided not to renew my membership since it's kind of boring and a waste of money! Oh heck yes, club penguin is just to much for me. i started club penguin just before the St. Patrick's Day party '08. i don't think they have that party anymore. i missed the sports shop, but it changed to an elite warehouse or something, i don't know. and when did they changed the layout of the newspaper? i missed the old dojo. i met a really good friend there. i don't even play club penguin anymore but, i respect what the makers of club penguin do to make it more "fun" and explore the island of club penguin for the little kids. but, the kids with memberships are so disrespectful to nonmembers. wearing a black hoodie, diva glasses, and sitting down front wards won't make you "cool". just sayin... i cut my membership more than half of a year ago. one of my best decisions i had to make. again, i respect what cp wants to do to make it more "fun". please, don't try to influence kids to get into to runescape. just one of those online role playing games like cp. just sayin. trust me, in the future, you will get sooo bored out of your mind. merry Xmiss Mimo777 I have only playd cp for about a year it is geting boring now from what i read from old cp i think i would have liked it better back then it has canged over the last year and i feel sad becuce i am a memder and all my frends are not so they can not play alot of games. I got tired of club penguin long ago...I used to love love love it I even had membership for a while and I owned every puffle and completed all the spy missions, but now I find it boring and childish. (i stopped when I was about 11) I also dislike the members treatment of non members, it's like if you're parents don't spend $6.00 a month on you you're not cool... I just randomly checked you're blog considering the fact that you helped me out countless times back when I enjoyed CP. You must have a great dedication to this website to still be blogging! well i do sometimes wish to see the old cp... but thats no reason to hate it. all disney is trying to do is, well ok so obviously they're trying to make money, but isnt business business? but yes i understand that it is wrong of disney to start making everything members only but i highly doubt thats waht they're doing. The result would probably be a loss o players and as for the holiday party... well yes i understand it was better for us as simply a christmas party but as billybob said "not all penguins celebrate christmas" but then again, where are all the other chanuka decorations? I know the christmas party 5 yrs ago had them in the coffee shop but all of this is absolutely no reason to quit cp that is plain stupidity unless of course your running out of money and cant pay for membership and dont like being a non member. So ill say it again... do not quit cp for these minor reasons and no cp is still the same old island u all used to know, but with more games and more rooms which is good because it expands the game and makes it better. hey mimo its me again and i forgot to say im 1119 days old and yes you saw my comment i do not see how us kids can start judging a hugely succesful company like disney and if anyone knows anything about money then u should know by now that world just went through reccesion and u cant balme disney for putting add on's when all they're trying to do is make money to replace the money they lost in the recession. im actually close to swearing my mouth out at the people who think disney is just plain bad and for anyone who still thinks this just wait till u gat a business! here is another complaint to everyone who says its bad nonmembers cant play games, well listen here: i do understand how bad nonmembers feel about being able to do nothing, but listen to my reason: why on earth do non members need to be able to earn coins if they have absolutely nothing to spend it on? take this info and think about it befor anyone else makes mor complaints and negative comments. and u do not know how hard im refraining from putting swear words in hear. heres one more thing for anyone whos made their name under anonymous and is literally screaming in their comments at cp and disney well listen up! the only reason ur all making your names anonymous is because u dont want people to start screaming at ur name in disgust making u all cowards if u ask me. well merry christmas mimo and a happy new year. thats enough ranting by me for now. im 444 days old, and i dont know much about old cp, but ive heard about it, and it sounds good (p.s i just found out disney BOUGHT it WOW!!!) this is my truthful thought: DISNEY IS RICH ENOUGHH, THEY MAKE MOVIES AND STUFF WHY DO THE NEED MORE MONEY!. Oh, ya, olso they should have an old days party, and they could make more serverws to spread out penguins, oh and finally buddies arent "buddies" mine arent really "freinds"
the thing is you have to pay for membership.thats all it is thyat bugs me. Too much Members Only things! Non Members get only hats! I`m sick of that hats!!! Disney Company screwed It up! I wish old Club Penguin can return! Yeah, I kinda do miss the old CP. It feels really childish now. club penguin is just toooo much now.I want disney to just stop interfering in the editing and all that. In fact i dont even really want then to make any products! Cp used to make TOO many cute things. WE want old days!! Yaay! It's CHRISTMAS!!! Merry Christmas everyone!!! and anyway this years partys were RUBBISH!! I miss it. I like the new stuff, I just don't like how Disney's pumping out CP toys and games. idk if ill quit it but im 1155 days old i remember when thaey had the hidden dojo and the OLD ice rink no snack bars. And the stage was building and the AWESOME parties not the fancy partys they ave now!!!!! Remember when the underground came out? Weeks and weeks of anticipation leading up to the release of NEW ROOMS!!! Then, they had the first members only event. A preview of the rooms. Since then, the members have been growing in influence. Advertising campaigns and major Disney boosts have only detrimented the island. I have 56 free items,not including backgrounds. Now, we are lucky to get 2 a year. I've been around on CP for a while now, and i hav to say, the older times were much simpler. You didn't hav to stay logged on for a long time looking around for prizes or getting coins. It used to be a lot more about having friends than having stuff. It seems too centered on activities and stuff than friends. Well I wasn't really on Club Penguin when the Old Club Penguin was here, but by all the things I'm hearing, it seems like The old Club Penguin was much better. It's not really fair about the Member only room and that's what gets me mad. My little sister isn't a member on Clubpenguin and almost EVERYDAY she freaks out about the member only room and it's driving me nutsss!!!!!! 1. Stamps- the only reason why cp made stamps is for you to play the games so they can get more money I mean lets face it , b4 stamps came out nobody played these mini games but now everyone are, also they do it for bragging rights. 2. Girlfriends- All these girls dress up as cheerleaders and also pretend they have iphones. After you had a 'date'and you login to a server and then click their playercard you see that they are dressed up as bay bees. 3. Non members rooms- have you noticed when there like 15 non members trying to get in a room and ur a member you can easily access a full room and every time there is a popular penguin eg. Rockhopper you cannot see any non members because cp wont nons enter full rooms.